Can you believe it? In a few short weeks summer will be over and it’ll be time to hit the books. If you or your child is headed back to school in the near future, make sure you’re outfitted with the right dorm room gear. 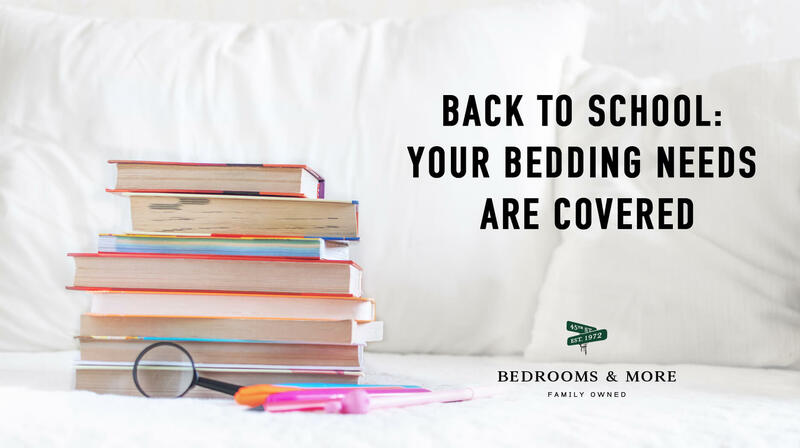 Without the right back to school bedding, they might not be getting the quality of sleep necessary to succeed. Bedrooms and More has everything you need to get a good night’s rest at a quality price. We can’t help you ace your exams, but we can make sure you’re well rested beforehand. Most schools opt for Twin XL mattresses. A great idea for making sure every student can sleep comfortably, but not always the easiest size for finding bedding. That’s where Bedrooms and More comes in. Don’t go store-to-store looking for individual items! All of our 45th Street Bedding products are available in Twin XL. So whatever you’re looking for, from mattress protectors to comforters, we have it in the size you need in one convenient place. For kids in the Greek system, a new mattress is worth considering too. Those mattresses can be pretty nasty. That first quarter in the house will be more manageable with a full encasement and a brand new bed. Some of those mattresses are a Petri dish of disgusting. Your school probably gave you a list of items you need to make yourself comfortable in the dorms. Make a checklist of the items you need, and the items you want. Noisy neighbors, inconsiderate roommates and cold feet can all make getting to sleep difficult. Because of that, it’s best to be prepared. If you have more ideas on what to bring along, let us know in the comment section. This entry was posted in Sleep, Bedding, Seattle Businesses, bedsheets. Bookmark the permalink.